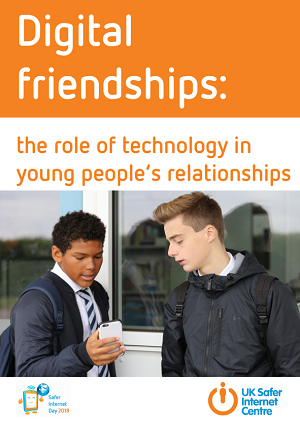 The report states that the "findings reveal how central technology is to young people’s relationship and the many different platforms they are using to interact with each other. It also highlights both the positive and negative role that technology can play in young people’s relationships and that whilst they are proactively helping to build a better internet, they also want support from the adults in their lives to do so". Young people aged 8-17 are using a variety of methods to express themselves online with emojis being the most popular (84%) followed by slang terms (72%), facial expressions in selfies (70%) and images (63%). Encouragingly, In the last year, 88% respondents said they had sent a kind message online to a friend who was feeling upset. However, the report also identifies the negative impact of online relationships with over half (54%) of respondents aged 8-17 saying that they would feel isolated if they couldn’t talk to their friends via technology and two in five (40%) respondents stating that they feel left out when people post things they haven’t been included in. Over a third of young people (36%) say that they feel that other people’s lives look more exciting than theirs on social media with girls more likely to feel this (40%) in comparison to boys (33%). The report identifies the support that young people are seeking when it comes to online relationships with more than seven in ten (72%) of those surveyed wanting their school to teach them about cyberbullying and how to manage friendships online. However, almost three in five (58%) respondents aged 8-17 say that they feel that teachers don’t always understand their online lives and 28% don’t feel like their parents or carers do. In conclusion, the report recommends that schools play an important role in educating and empowering children and young people to use technology respectfully, responsibly, critically and creatively, and in establishing a culture of kindness and supportiveness that promotes student wellbeing. From Computing to Relationships Education and PSHE, it is essential that education keeps pace with changes in technology, to ensure that interventions are relevant, engaging and effective. Schools play an important role in offering positive opportunities for learning and creativity, as well as helping young people to harness the power of technology to make a positive difference. This report shows the range of strategies that young people would use if something upset them online and schools can help to ensure young people both know and use these strategies to cope with any difficulties they experience.